Successfully Added Meeteasy Omega Conference Business Phone to your Shopping Cart. New conference phone for business. Coming with omni-directional microphones, a powerful central speaker and an automatic audio quality control feature, the Meeteasy Omega understands the need for clear and easy conversations in business and is the ultimate solution to your daily communication needs. The Meeteasy Omega has 3 built-in high sensitivity microphones at 120 degrees apart (360 degrees total), allowing a full 3+ meters audio range coverage. Designed with full duplex technology that allows communication in both directions simultaneously, this allows the caller to hear more than one speaker (person talking) while being heard by the other parties all at the same time. The Meeteasy Omega can be used for IP calls as well. This product supports internet conference meetings through instant messenger applications such as SKYPE / MSN / YAHOO, making this fantastic model ideal for small to medium business. 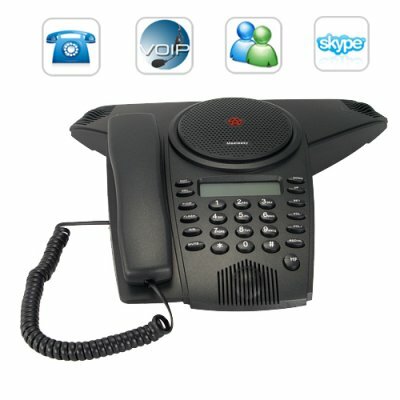 It also supports 3-party conference calls and supports recording functions for later referencing or staff training. The Meeteasy Omega provides true versatility for what is required from conference business phones. It also comes with internal advanced noise cancellation technology that isolates interferences and un-identified background noises, allowing you hear your caller loud and clear with out any stress. And one other important thing to note: it is LOUD. The speaker in this conference phone is louder than any phone speaker you have ever heard before. Plus. you can also connect the phone to your computer and use your computers desktop speakers if you really want to hear what that quiet talker is saying on the other end of the phone. CALL TO ACTION: This product is in stock and available for immediate shipment. Buy a single piece to test this business conference phone for yourself and then buy in bulk to receive the lowest possible price and save on per unit shipping to your local warehouse. This exciting new conference business phone is presented to you exclusively by the leaders in China Wholesale Electronics, Chinavasion! Omnidirectional microphones with strong 4 meters maximum range, you don't have to bring you head forward to the center of the conference table. Can this conference business phone be used as a normal land line in my home for Skype calling? Yes you can, just connect the Meeteasy Omega business phone to your computer and you can instantly start using it for internet calling. Can the CVMY-G153 (a.k.a. The Meeteasy Omega business conference phone) be used simultaneously by connecting it to a landline number and my computer? yes, you can the CVMY-G153 support both ordinary land line connectivity and PC connectivity simultaneously. How can I record conference calls using the Meeteasy Omega business phone? The Meeteasy Omega business phone, come with a 3.5mm jack output plug-in. By using the 3.5mm jack cable provided you can use any voice recording devices such as our Digital Voice And Telephone Recorder - Model CVJP-L05 to record both the caller and the receivers conversation.